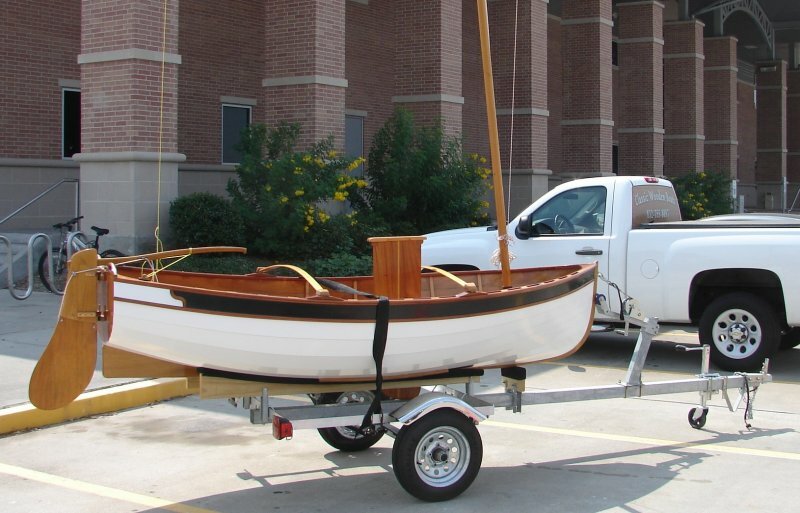 Walter Hansen completed this glued lapstrake tender in April 2011, just in time for the Keels and Wheels Concours d’Elegance in Seabrook, Texas, at which he received a Corinthian Award. He based her lines on the Puffin design by Iain Oughtred, making some modifications including replacing the knees with half-frames and putting hand holds on the transom. The tender has a white oak laminated stem, okoume plywood hull, amd brightwork of mahogany and alder. The transom, gunwale, thwarts, centerboard case, stern sheets and floorboards are mahogany. Gunwale spacers, sternsheet beam, floors and half-frames at the thwarts are alder. Sternsheets and floorboards are bookmatched. The kick-up rudder and centerboard are mahogany with alder accents. 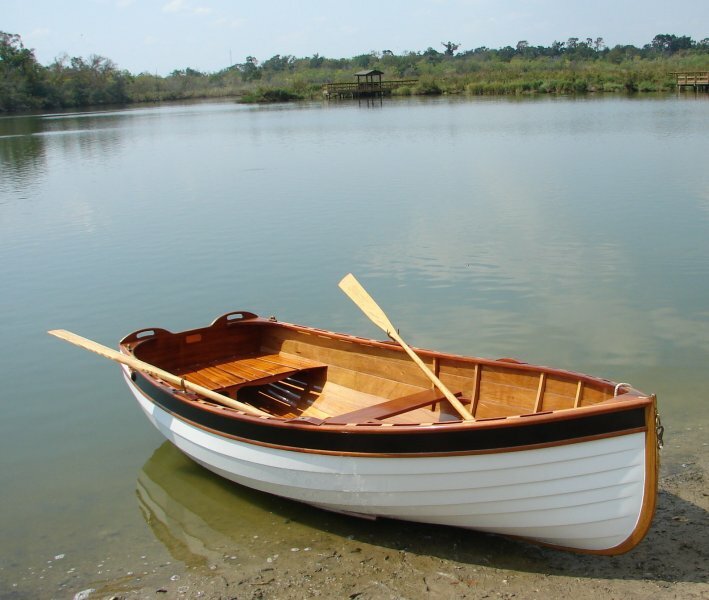 Walter built the tiller from white oak, the spars from Sitka apruce, and the oars from ash. Twas made by Banks Sails of Kemah, Texas made the 54 sq. ft. tanbark sail. Weighing just 85 lbs., Walter adds that she rows and sails like a dream in the lightest of air. Walter took the in-water photos at Armand Bayou Nature Center in Clear Lake, Texas. Walter donated it to the Holocaust Museum of Houston as part of a fundraising effort for the restoration of a 1942 Danish Fishing Boat that represents Danish efforts to save more than 7,200 Jews during the Nazi occupation of Denmark. 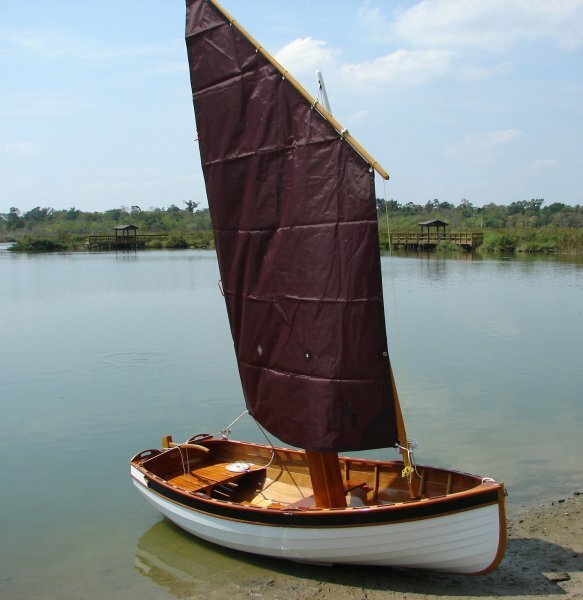 Contact Walter Hansen, at Classic Wooden Boats, whansen@comcast.net, or 832-755-8097.